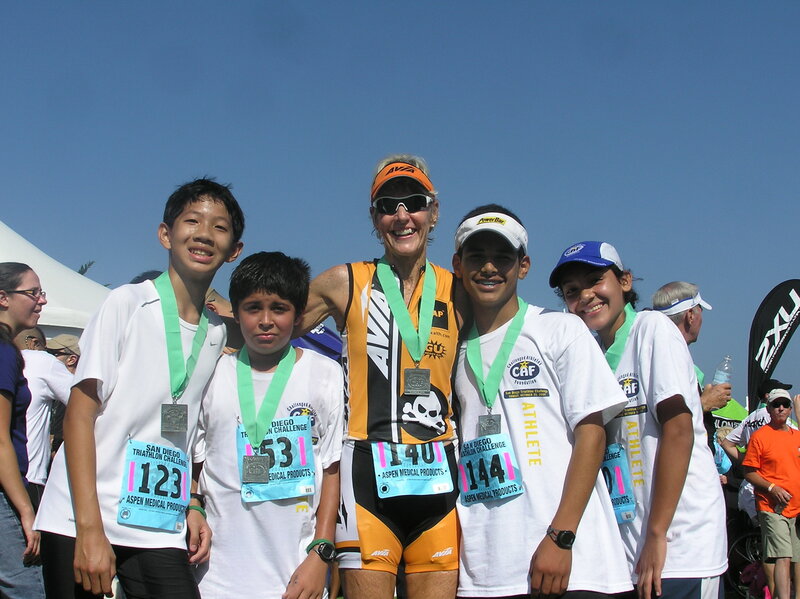 Cherie Gruenfeld is one of the crown jewels of triathlon racing. She is many faceted and shines as one of the best of the best. When you list her accomplishments they become a staggering list of wins and near wins. 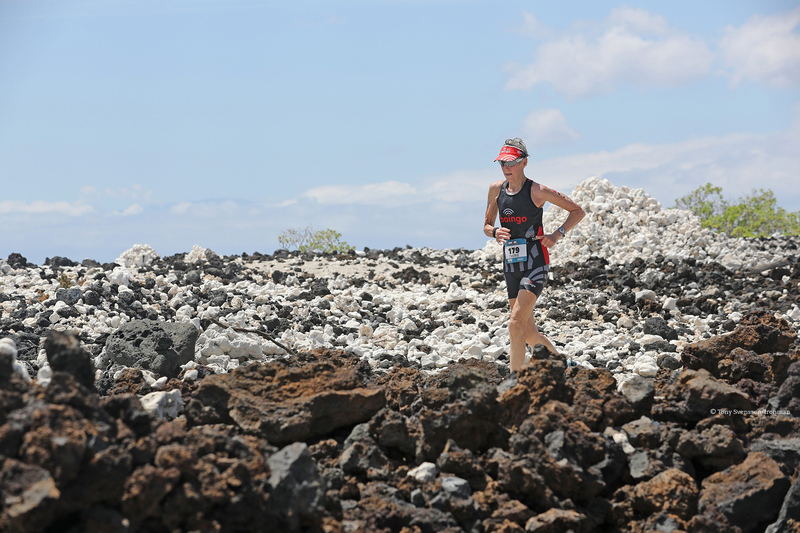 Considering Ironman alone from 1992-2000, she has nine consecutive finishes in Hawaii and four Age Group wins, including back-to-back first-place finishes in 1999 and 2000. She holds the current Age Group record of 11:58:29 in the 55-59 Age Group, which she set in 1999, her best finish ever. She set standing course records when she finished first in her age group at Ironman Europe ’97 with a time of 11:17:42, and at Ironman Lake Placid ‘99 with a time of 12:23:07. She also placed second at Ironman New Zealand in 1994. Cherie earned the only perfect 100 score in the 1999 World Triathlon Corporation Age-Group Rankings, which won her the unofficial title of the “fittest of the fit” for Ironman age-group racing that year. In tribute to her excellence, Ironman named her women’s 2000 Age Grouper of the Year. Phew! Does this mean she eats, sleeps and lives for triathlons? You would think so, but not by a long shot. Although she was on the All-American Team from ’94 thru ’99 and was ranked #1 (USAT) in ’94 and ’99, she found time to branch out to other sports. Cherie competed in the Furnace Creek 50’s Bike Race, the first all-women-over-50 team. She also was a Gold Medalist in ’96, ’97, and ’98 in the Snowshoe Race at the Senior Winter Games. Cherie’s husband, Lee Gruenfeld, is a successful novelist. Since she has now retired, they split their time between their homes in Lake Arrowhead and Palm Springs, spending several days at each place during the week. This gives Cherie plenty of variety in her training locale. She starts training the end of February or the first of March and has a fairly set schedule. She takes Monday off, Tuesday she swims and bikes, Wednesday swims and does a “brick”, Thursday swims and does a long bike, Friday swims and does a run in the hills. On Saturday she does a ride with some climbs and on Sunday she does a long run followed by a swim. When she trains she’s very serious about it, but during the off-season – it’s time to play. She still bikes, swims and runs but not with the same intensity. That’s when she does her snowshoe racing and women’s bike rides. So much has been written about this athlete that you wonder, is there more to know about Cherie? The answer is definitely yes. Cherie has a background in the computer business, was an elementary teacher and also taught children with learning disabilities. Now that she’s retired, she uses her time to coach others. She also does a lot of public speaking. Last year she was giving a motivational speech at a school in a high-risk environment on Exceeding Your Expectations. She used athletics as one method for setting goals and building discipline. After her talk, she asked the teachers to recommend some students who might be willing to train for a triathlon. In December, she started out with 14 boys and one girl, ages 11and 12. These kids were from poverty-level families and had no clothes or equipment for training for a triathlon. Cherie’s friends donated money for running clothes and shoes, and helped repair donated bikes. The kids made a commitment and were faithful in their training. It was up to Cherie and the teachers to get the kids where they needed to be because the parents were either not interested or didn’t have the means to do it. 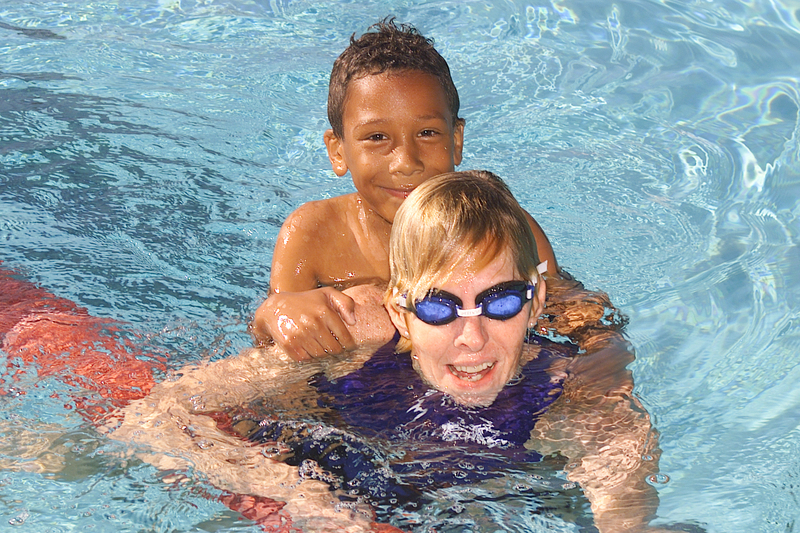 None of the kids knew how to swim, so the high school swim team agreed to do the swim leg for them. Their first race of the season was the Desert Tri on April 8, 2001. The kids spent the night in a motel and were raring to go at race time. Cherie and all fifteen of her kids finished the race and were the hit of the day for the crowds. They gave high five’s to Bill Bell while out on the course and were really excited when Cherie introduced them to Paula Newby Fraser. The changes in these 15 kids have been very noticeable and they’re pleased to be the envy of their peers (more want to join the program now!). With her usual dedication, Cherie plans to continue on through the summer with her team of youngsters. Even the high school boys who did the swim leg are all excited now and want to try a triathlon themselves. How’s that for being motivational? 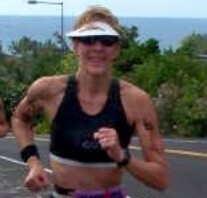 So Cherie will continue her training for Big Rock, Wildflower, Keauhou, Lake Placid in July and then on to Kona with Lee. Hopefully she’ll make this three for three and take that Age Group Crown again. Even though she’s been undefeated in 1999 and 2000, she never takes a win for granted, believing there are always women to challenge her. This is one classy lady and deserves all the accolades she receives.